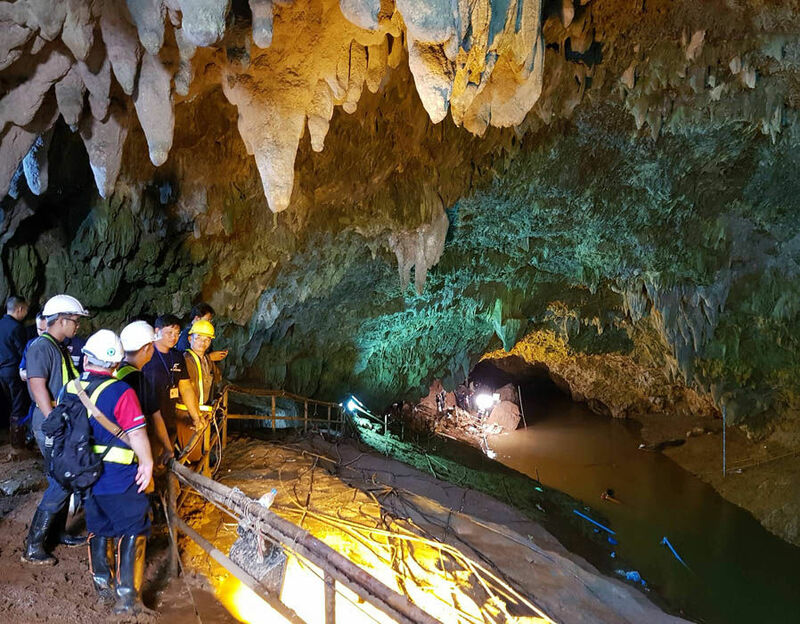 THAI officials keep on racing against time to save the 12 young footballers and their 25-year-old coach trapped in a cave, but the choices are extremely limited and bring ‘significant dangers’ to the inexperienced young lads. The football team went missing amid a school trip on June 23 after glimmer flooding into the Tham Luang Nang None collapse Northern Thailand. Rescue jumpers and Navy seals unimaginably discovered each of the 12 youngsters and their 25-year-old coach and started to race against time to pull the entire team out of the overflowed natural hollow. The youngsters are as of now being instructed on how to utilize SCUBA diving gear but according to media, none of the 12 kids can swim. The three-hour swim is challenging notwithstanding for the two British divers who discovered them, who are among the best on the planet. The divers who are advancing in and out to see the young lads are being left with cuts and wounds as they explore the dull, and narrow caves. To compound the situation, water has been unintentionally pumped into the cave as opposed to being sucked out by volunteer rescuers, making a day worth of work relatively pointless. Meanwhile, football stars have urged the Thai team caught in the cave to “Stay Strong” as messages of support and concern poured in for the 12 youngsters and their coach. Players such as Ronaldo DeLima, England’s John Stones said they were firmly following attempts to rescue the team, whose unfortunate ordeal coincides with the World Cup in Russia. “It is terrible news and the world of football hopes that someone can find a way to take these kids out of there,” said Ronaldo at a FIFA media event, according to ‘CNN’. Liverpool manager Jurgen Klopp told the team, “You’ll never walk alone“, quoting the motto of the English side which has a large following in Thailand. “Stay strong and know we are with you,” Klopp said in a video message sent to ‘CNN’. World body FIFA told ‘CNN‘ it was in close contact with the Football Association of Thailand, while Croatia’s football authority said it was “awed” by the team’s calm under pressure. “We are awed by the bravery and strength that these young boys and their coach have shown amidst such frightening circumstances,” the Croatian Football Federation said on its website. Channel NewsAsia’s Glenda Chong explained in details the many challenges the young boys and their coach would have to face if authorities decided to guide them out of the cave via diving and swimming through the tunnel. She said: “What’s being considered now is getting the group to dive out but this poses major risks. First thing is the water flow is very strong in some parts. It’s also muggy, meaning visibility is practically zero. “A confined space, that’s also an issue because in some areas it is so narrow that divers had to take their tanks off to squeeze through. “Most of these young boys don’t know how to swim, let alone dive. “Rescue teams are now giving them crash courses. “A starting rope which is already in place should help. “It can guide each boy and his rescue diver out. “Alternatively, rescue divers can position themselves along the route passing the boys. “And they’re also likely to position oxygen tanks at regular intervals to ensure enough air supply.